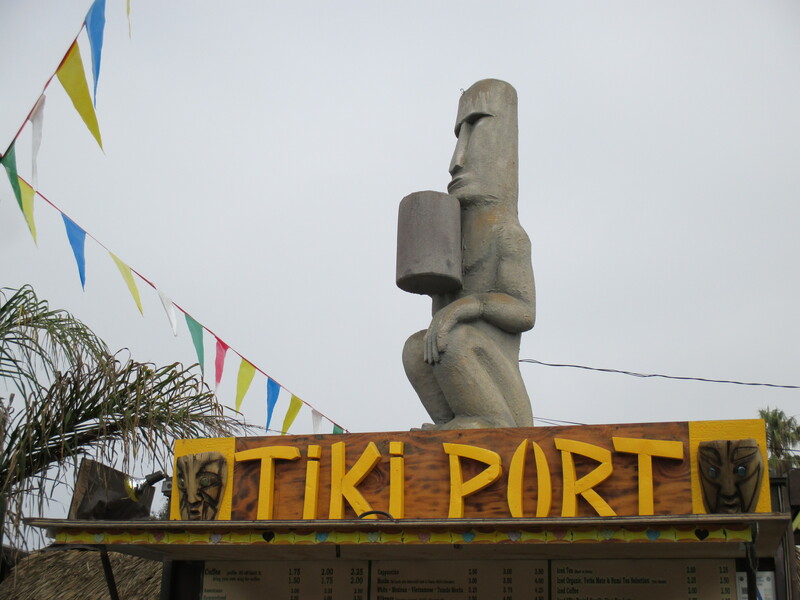 Look for a giant Tiki god with coffee cup in hand perched on top of a drive-thru coffee stand & you’ve found your slice of coffee heaven for the day. If there’s a line, pull into one of the side lanes & someone will walk over to take your order (or park to the side & get it yourself). There are tables for walk-up customers to watch OB surfers & traffic pass by. I had a rich Turkish roast that sustained me for the day. As I drove away, I heard the barista say to the next car, “The usual?” The giant Tiki drinking coffee drew me in, but the coffee & service will keep me coming back. Pull out carefully, though, as you don’t want to clip the busy staff. Most coffees are roasted by Daymar, an East County roaster, but for Dunkin’ Donuts fans they carry their coffee, too, as well as Cafe Moto’s organic Blue Sky. It’s cash only, but they do have an ATM onsite. This entry was posted in Coffee shops in San Diego and tagged Coffee, Ocean Beach, San Diego, Tiki. Bookmark the permalink.